Now in its 35th year of operation, the Carrboro Farmers’ Market kicked off at 3 p.m. on April 9. While some vendors have been coming to the market since its inception, others offered up their produce for the first time Wednesday. From vendors specializing in micro-greens to hot dogs, Carrboro Commons’ Co-Editor Alex Dixon takes a look at some of the suppliers to see where they’re from and what they’re offering. Laurie Heise has been coming to the Farmers’ Market since 1986 and farms in Chatham County, about four miles west of Pittsboro. 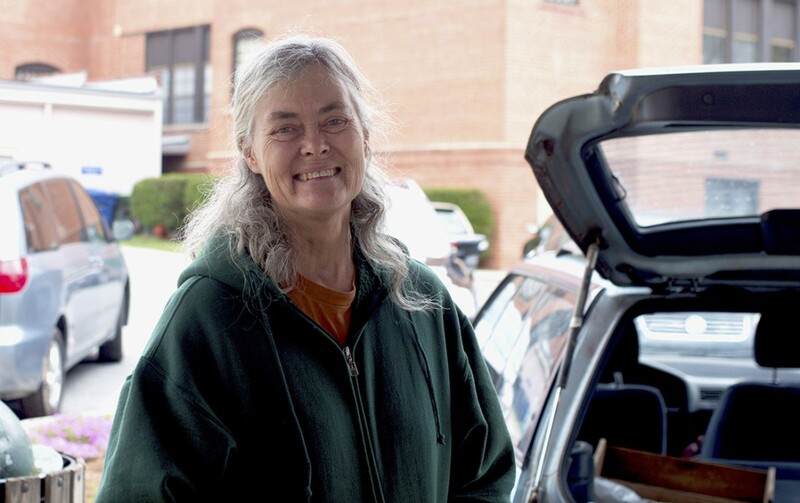 On Wednesday, she was selling produce, such as kale, as well as sweet potatoes. “(Here,) the customers are friendly, loyal, fun to talk to, and willing to try new things,” Heise said. 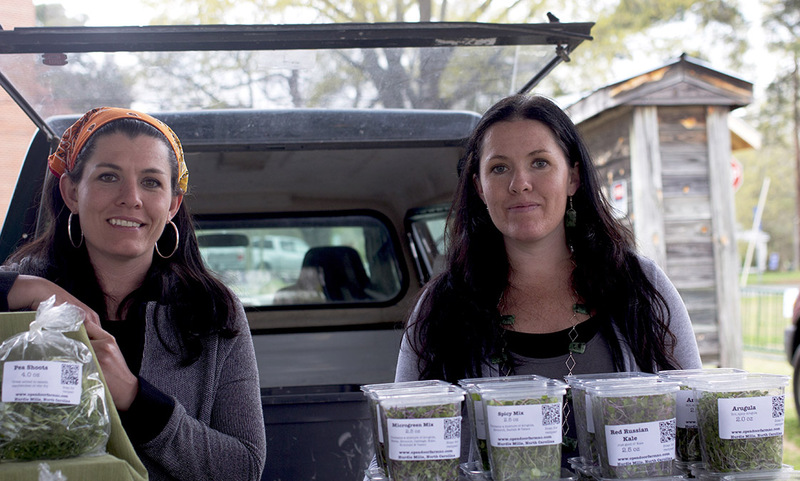 For Jill Mickens and Heather Barker, Wednesday was their first time selling at the Carrboro market. They specialize in micro-greens out of Open Door Farm in Hurdle Mills, about 10 miles north of Hillsborough. Mickens said it’s an incubator farm, which is a farm used to support beginning farmers before they go out to purchase their own land and resources. 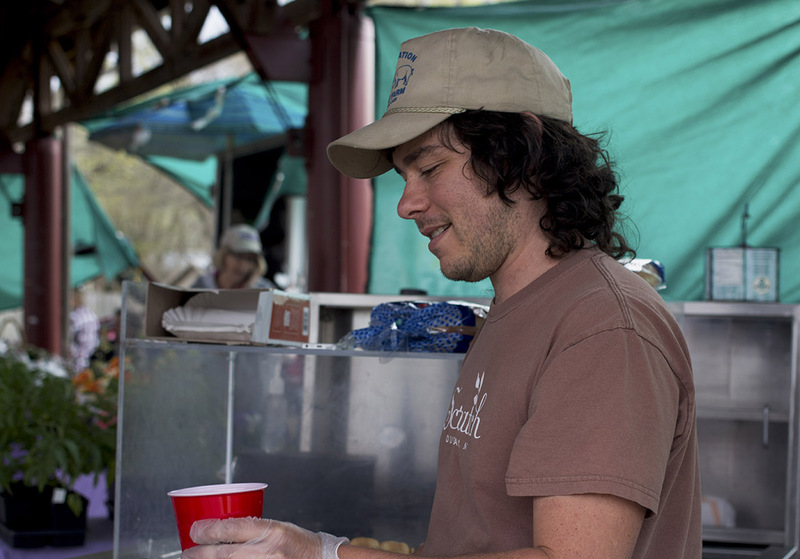 Sam Suchoff, chef and owner of The Pig in Chapel Hill, serves homemade hot dogs and iced tea from the restaurant’s location on Weaver Dairy Road. He’s been coming to the market for four years and says there’s a lot more interaction with the customers at the market as opposed to the restaurant. 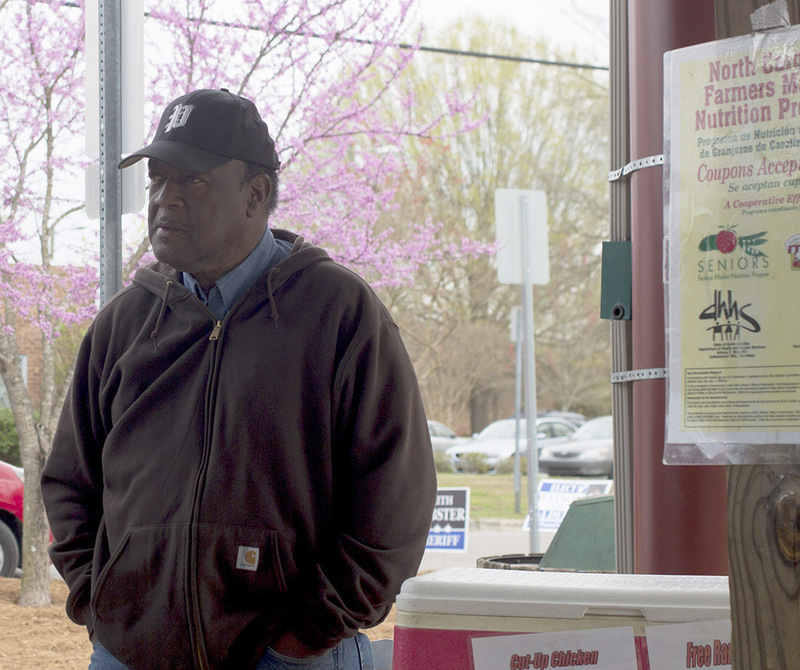 When asked how long he’s been farming, Stanley Hughes said, “forever.” Now in his 14th year at the market, he sells a variety of meat and vegetable goods from Pine Knot Farms in Hurdle Mills. 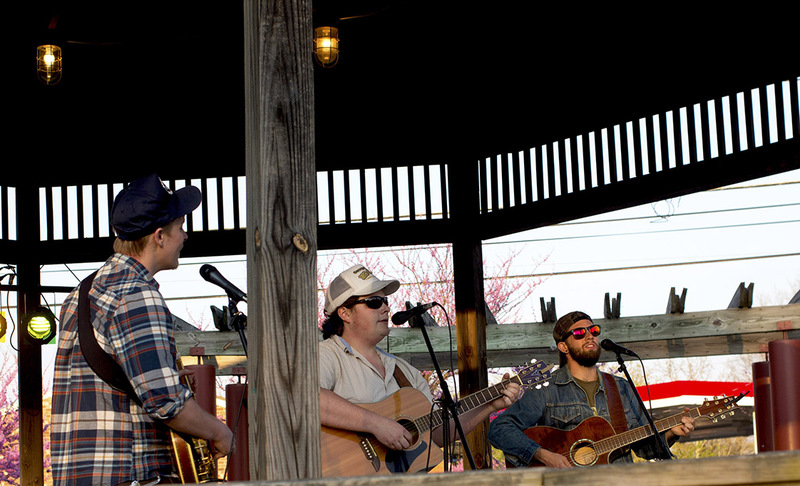 After the market ended at 6 p.m., the venue, at 301 West Main St., hosted Evening Eats, an event with food trucks from around the Triangle and live music. 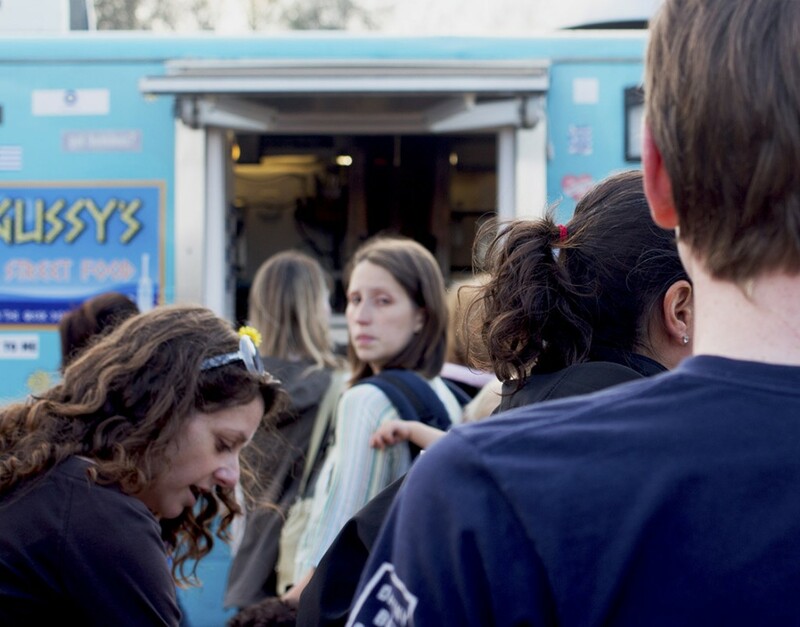 The line for Gussy’s Greek Food Truck, out of Durham. 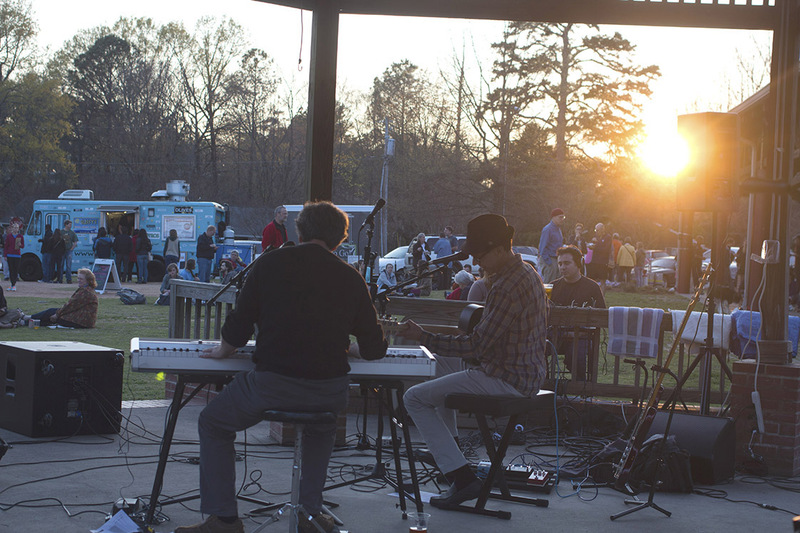 The Lounge Doctors, a pop and blues-influenced band from Cary, perform at Evening Eats. Campfires and Constellations, a band founded by two UNC-Chapel Hill students, perform their traditional mix of bluegrass, folk and country.